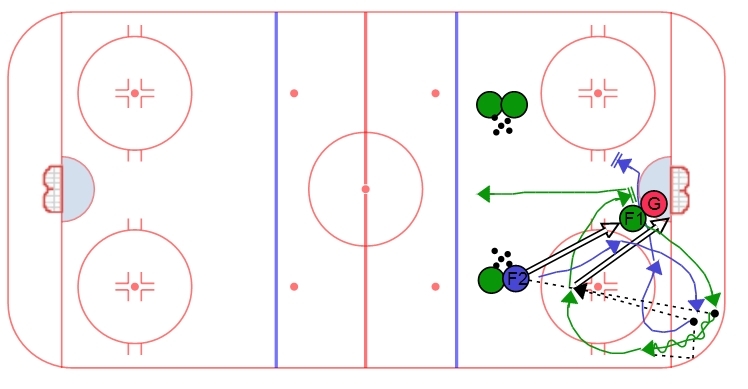 This drill can be run during half ice practices or when forwards and defense are split up. It is primarily a drill for forwards that focuses on cycling. Footspeed, communication, and understanding how to cycle the puck are important areas of focus. This drill starts with F1 in front screening the goalie. F2 takes three strides and shoots in stride through the sceen provided by F1. F1 turns around and plays out the rebound. The next player in line then plays a puck into the corner for F1 to retrieve. F1 retrieves the puck and moves up the wall, F2 provides support in the corner, F1 cycles the puck down low to F2 and F2 give a pass right back to F1 for a shot. Both players should end up at the net. Then F2 becomes F1 for the next player in the other line by setting up in front of the goalie.